Here are real-world examples of how to disappear from Facebook. New Zealand’s gourmet burger joint, Velvet Burger, likes to push the digital envelope. Among its Facebook acceptable posts, such as promoting its vegetarian burger options, supporting its local rugby team and sharing company-produced memes, were a couple posts that got the trendy brand in hot water. So much so that one tactic led to its Page being deleted (see image) and the other heeded an official company apology. 1. 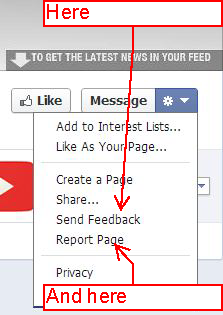 Promotions on Facebook must be administered within Apps on Facebook.com, either on a Canvas Page or a Page App. 2. Promotions on Facebook must include: a complete release of Facebook by each entrant or participant; acknowledgement that the promotion is no way sponsored, endorsed or administered by, or associated with, Facebook; and disclosure that the participant is providing information to [disclose recipient(s) of information] and not to Facebook. 3. You must not use Facebook features or functionality as a promotion’s registration or entry mechanism. For example, the act of liking a Page or checking in to a Place cannot automatically register or enter a promotion participant. 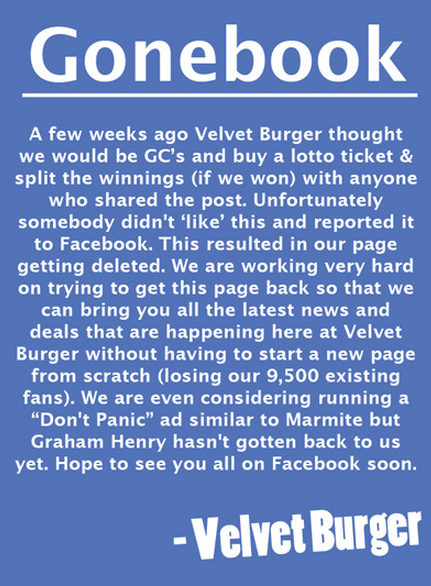 After this debacle, it appears that Velvet Burger was able to get its nearly 10,000 fans back on board (today it has 12,796 Likes), but it may have taken nearly two months to sort out. The brand regularly posts daily, sometimes even twice a day, and there is a notable brand absence between March 29, 2012 and May 18, 2012 (with no posts whatsoever). Additionally, its official Page has a born date of 2011, which most likely means the company regained all of its previous standings. As for the aforementioned company apology, Velvet Burger managed to apparently stay out of Facebook’s radar with a controversial ad generated through a Page post, but offend consumers in the process. This is because the ad made light of the infamous domestic violence case between Chris Brown and Rhianna, as it stated “beatings by chris brown” with the post, “come down and ‘smash a burger.’” As seen in the previously linked articles, the company pulled the ad and replaced it with an apology. 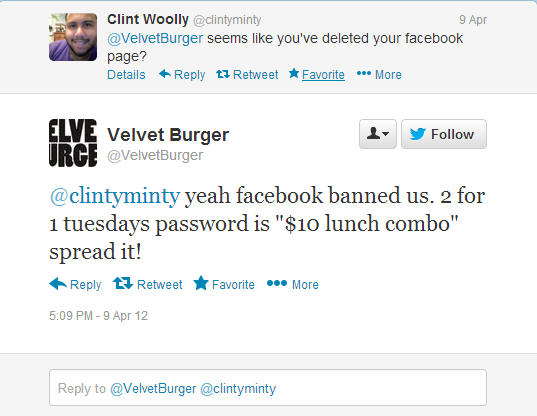 Velvet Burger’s Facebook administrator, which one article on the situation claims to be a college student, clearly thought he or she was being clever, but Facebook’s Advertising Guidelines state that ads must not offend users. Although defining offensive is overly subjective, Facebook continues that “ads may not be shocking, sensational or disrespectful, or portray excessive violence.” It’s important to note that Page post content are considered Ads and commercial content by Facebook and fall under its Advertising rules. Velvet Burger, in this editor’s mind, absolutely did the best thing for its brand when it apologized for the ad on its Page, rather than deleting it and not referring to it. In fact, that is what Intel instructs its employees to do. By its very name, Hell Pizza is a bit unorthodox, and the brand certainly plays up its namesake with its marketing. But that’s not the reason why the U.K. pizza chain was deleted (and ultimately re-established) by Facebook, in 2012. Several reports, tell us that Hell Pizza sponsored a charity, The Little Lotus Project, and pledged $1 for every Like the Page received. By Randles’s report, the company filled out multiple forms, but after weeks of no action by Facebook, it was meeting someone who worked for Facebook Australia at a barbecue that got the company’s page turned back on. Facebook provides two different ways to report Pages to its staff (see image), but either mistaken or malicious complaints can get a company removed from the network, which could have been the case for this blogger whose Page was deleted in 2011. “Although I absolutely love what happens on our FB page, what's the point when even one of the most spectacular communities on the Web can be ‘removed’ on a whim, on the say-so of one competitor?” the blog stated in 2011. Additionally, a quick search on Quora, turns up the following question, “How can I report my competitors to Facebook if they violate FB’s promotion guidelines?” People suggest reporting the page to Facebook continually and asking friends to mark the Page as spam. The moral of the digital story is to follow the rules and color in between the lines. The most white-hat companies can make mistakes, but the Facebook Pages Terms are available – in black and white – for an enterprise to study.